From September 2010 to July 2016 APA worked with the International City/County Management Association (ICMA), the National Association of Regional Councils (NARC), and alongside ICLEI – Local Governments for Sustainability on the SunShot Solar Outreach Partnership (SolarOPs), an initiative of the U.S. Department of Energy (DOE). Through this effort, APA and its partners provided outreach, training, and technical assistance to local and regional governments to make it easier for residents, businesses, and property owners within their jurisdictions to use solar energy. DOE's compilation of best practices titled "Solar Powering Your Community: A Guide for Local Governments" served as a foundation for the partnership's efforts. To find resources from APA's SolarOPs partners, visit SolarOutreach.org. 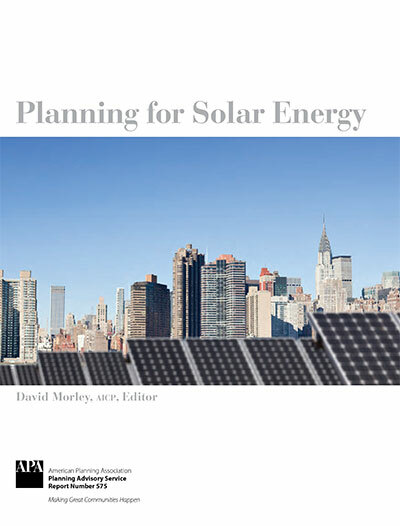 This comprehensive and authoritative report provides planners with a basic rationale for planning for solar energy use, summarizes the fundamental characteristics of the U.S. solar market as they relate to local solar energy use, and explains how planners can take advantage of five strategic points of intervention to promote solar energy use. Solar Powering Sunnyside is a new participatory planning exercise that uses game play to help community members understand solar development options from a land-use planning perspective. Through this portal you can search hundreds of examples of solar-supportive plans, development regulations, and other planning-related implementation tools. This compendium of background articles, plan excerpts, and sample ordinances shows how communities are promoting solar energy use through local plans and development regulations. This series of six briefing papers covers a range of specific topics related to planning for solar energy use. Each paper tackles a different aspect of the issue with a special emphasis on how local plans and implementation tools can reduce barriers to local solar energy use. This handout presents an overview of five strategic points of intervention for promoting solar energy use. This webinar explained why communities should be planning for solar energy use and offered guidance to planners, public officials, and engaged citizens to help them initiate and facilitate conversations about solar in their communities. David Morley, AICP, Senior Research Associate with the American Planning Association, and Brian Ross, Principal with CR Planning, explained why communities should consider solar energy use from a planning perspective. They discussed opportunities that planners, public officials, and engaged citizens have for initiating community conversations about solar energy as a local resource. Finally, they shared some specific tools communities can use to build awareness about solar development opportunities. This webinar took a closer look at how communities can incorporate references to solar energy use as well as specific solar-related goals, policies, and actions into local plan documents. Erin Musiol, AICP, Senior Research Associate with the American Planning Association, focused on the relationships among different types of plans, the reasons for including information about solar energy in different plans and plan sections, and the types of information to consider including in these plans. Musiol was joined by Steve Abraham, AICP, Planning Manager for Pinal County, Arizona, and Nathan Geisler, Energy Programs Associate with the City of Ann Arbor, Michigan, who personalized the conversation by describing their communities' respective experiences integrating solar into a comprehensive plan and a functional plan. This webinar explained the importance of addressing solar energy use explicitly in local development regulations and highlight some specific types of provisions communities should consider adding to their codes. Ann Dillemuth, AICP, Research Associate with the American Planning Association and Darcie White, AICP, Principal with Clarion Associates, discussed how zoning, subdivision, and building code provisions can promote solar energy use, with a special emphasis on standards for principal and accessory-use solar energy systems, solar access and solar siting provisions, and solar-ready requirements. Through its participation in the SunShot Solar Outreach Partnership, APA presented a free webinar exploring how communities can use solar development to enhance resilience. As global temperatures and energy demand rise, energy and climate experts expect energy prices to escalate and extreme weather events to increase in frequency. Both affect disabled, elderly, and low-income populations disproportionately. While the potential role of solar power in mitigating climate change is well established, the relationship between solar energy and community resilience deserves greater attention. In this webinar, local energy planner Stephan Schmidt highlighted a number of potential connections between solar energy use and community resilience and present a series of recommendations for local governments. Hazards planning expert Jim Schwab, AICP, discussed opportunities to improve energy security and reduce economic uncertainty by integrating solar development into hazard mitigation and post-disaster recovery planning efforts. Clean energy finance expert Rob Sanders discussed planning and financing clean, resilient power projects (i.e., using solar energy systems with on-site storage to power critical infrastructure). How do other communities encourage the use of solar energy systems through their comprehensive plans? The local comprehensive plan presents a future vision of the physical, social, and economic characteristics of an entire city or county, and it specifies goals and policies intended to implement that vision. Because it is the most expansive official policy statement of a city council or county board, it is an ideal tool to support the deployment of solar energy systems on both public and private property. There are two primary mechanisms by which comprehensive plans can support solar energy system deployment: (1) documenting the solar resource and (2) articulating policies to guide decision making. First, comprehensive plans can provide information about the solar resource available in different parts of the community. This may be in the form a solar resource map showing which areas receive the most sunlight annually, or it may be a text description of site characteristics that maximize solar potential. Second, comprehensive plans can articulate specific policies to guide decision making about solar energy system deployment on public and private land. These policies may address solar access protection, street and building orientation, or preferential locations for new solar energy systems. Fort Collins (Colorado), City of. 2011. City Plan. Environmental Health: Energy. Jackson (Oregon), County of. 2007. Jackson County Comprehensive Plan. Section 11, Energy Conservation. Greensburg (Kansas), City of. 2008. Greensburg Sustainable Comprehensive Plan. Housing; Future Land Use and Policy. Owensboro Metropolitan Planning Commission. 2007. Comprehensive Plan for Owensboro, Whitesville, Daviess County, Kentucky. Section 710. Climate and Solar Access. Pinal (Arizona), County of. 2009. We Create Our Future: Pinal County Comprehensive Plan. Chapter 7, Environmental Stewardship – Energy. Pleasanton (California), City of. 2009. General Plan 2005–2025. Energy Element. Shakopee (Minnesota), City of. 2009. Comprehensive Plan 2030. 12, Solar Access. Victoria (Minnesota), City of. 2010. 2030 Comprehensive Plan Update. Part II.L.1, Plan Elements – Special Resources – Solar Access Protection. Prepared by TKDA, St. Paul, Minn.
How do other communities use development regulations to protect solar access? The most effective point in the development process to protect solar access is when a parcel is being subdivided into lots for sale. Some communities have development regulations that require developers to orient and design lots so that structures of a certain height at certain location on each lot will not block solar access to adjacent lots. In effect, each lot then has a permissible building envelope where a structure can be built while still allowing the adjacent lot to the north access to the solar resource. There is no single default method for protecting solar access in areas that have already been developed. A number of development regulations include a process for obtaining solar access permits or recording solar easements, which establish a right to solar access for an existing or planned solar energy system on a specific lot. Beyond enabling solar access permits for a specific solar energy system, some development regulations require new structures on existing lots to conform to "solar setbacks" in order to protect solar access more generally. These setbacks are determined by a formula that factors in the height of the structure, the angle of light when the sun is at its highest point on December 21 (i.e., the winter solstice), and the slope of the lot. As an alternative, a few communities use the concept of a "solar fence" in their development regulations to protect solar access for existing lots. A solar fence is a hypothetical opaque fence of a specific height encircling a lot. New structures must not create more shade than would be created by this solar fence. Ashland (Oregon), City of. 2011. Municipal Code. Title 18, Land Use; Section 18.70, Solar Access. Boulder (Colorado), City of. 2011. Boulder Revised Code. Title 9, Land Use Regulation; Chapter 9-9, Development Standards; Section 9-9-17, Solar Access. Fort Collins, Colo.: Colorado Code Publishing Company. Clackamas (Oregon), County of. 2011. County Code. Title 12, Zoning and Development Ordinance; Section 1000, Development Standards; Part 1018, Solar Balance Point/Infill Ordinance, and Part 1019, Solar Access Permit Ordinance. Fort Collins (Colorado), City of. 2011. Land Use Code. Article 2, Administration; Division 2.8, Modification of Standards; Section 2.8.2, Modification Review Procedures. Article 3, General Development Standards; Division 3.2, Site Planning and Design Standards; Section 3.2.3, Solar Access, Orientation, Shading. Article 5, Terms and Definitions; Division 5.1, Definitions. Fort Collins, Colo.: Colorado Code Publishing Company. Laramie (Wyoming), City of. 2009. Code of Ordinances. Title 5, Business Taxes, Licenses and Regulations; Chapter 5.58, Solar Rights Permit System. Tallahassee, Fla.: Municipal Code Corporation. Prairie du Sac (Wisconsin), Village of. 2008. Code of Ordinances. Title 10, Land Use Regulations; Chapter 8. Solar Access. San Luis Obispo (California), City of. 2011. Municipal Code. Title 16, Subdivisions; Chapter 16.18, General Subdivision Design Standards; Section 16.18.170, Easements for Solar Access. Seattle, Wash.: Code Publishing Company, Inc.
Santa Barbara (California), City of. N.d. Solar Access Packet. Municipal Code Chapter 28.11, Protection and Enhancement of Solar Access. How do other communities use development regulations to encourage appropriate solar orientation for new development? The most effective point in the development process to encourage solar orientation is when a parcel is being subdivided into lots for sale. Some communities have development regulations that require streets and lots to be oriented to maximize the solar resource available to each lot or to a minimum percentage of lots. Typically, development regulations do not specify a rigid site plan for all new development. Instead, the regulations set a goal for the minimum percentage of houses that will have an east-west orientation for their longest side. In practice, this might be achieved through a wide range of street and lot design options. Clackamas (Oregon), County of. 2011. Zoning and Development Ordinance. Section 1017. Solar Access Ordinance for New Development. Dixon (California), City of. 2011. Zoning Ordinance. Section 12.19.21. Single Family Residential and Secondary Living Units Design Standards. Section 12.27. Energy and Water Conservation Regulations. Laramie (Wyoming), City of. 2011. Unified Development Code. Chapter 15.14, Development Standards; Section 15.14.030.A, Solar Energy; Part 3, Solar Oriented Lots. Chapter 15.28, Definitions. Oakridge (Oregon), City of. 2011. Zoning Code. Article 15, Subdistricts; Section 15.04(8), Planned Unit Development Subdistrict. San Luis Obispo (California), City of. 2011. Municipal Code. Title 16. Subdivisions; Chapter 16.18, General Subdivision Design Standards; Section 16.18.160, Energy Conservation. Seattle, Wash.: Code Publishing Company, Inc.
Santa Clara (California), County of. 2011. County Code. Division C12, Subdivisions and Land Development; Article IV, Requirements; Part 9, Solar Access for Subdivision Development. Tallahassee, Fla.: Municipal Code Corporation. Do any communities require developers to build "solar-ready" homes? A growing number of communities are either requiring or incentivizing the construction of "solar-ready" homes. In essence, the phrase "solar ready" means that the home is constructed in such a way that installing and connecting a solar energy system (whether photovoltaic or solar thermal) does not require additional wiring, plumbing, or building modification. Typically, when communities elect to require solar-ready homes, they add provisions to the local building code. Alternately, some communities use their development regulations to incentivize solar-ready homes by making solar-ready construction eligible for a density bonus. Chula Vista (California), City of. 2011. Municipal Code. Title 15, Buildings and Construction; Chapter 15.24, Electrical Code and Regulations; Section 15.24.065, Photovoltaic Pre-Wiring Requirements. Chapter 15.28, Plumbing Code; Section 15.28.015, Solar Water Heater Pre-Plumbing. Code Publishing Company: Seattle, Wash.
Henderson (Nevada), City of. 2011. Development Code. Chapter 19.7, Development and Design Standards; Section 19.7.12, Sustainability; Table 19.7.12-1, Menu of Site and Building Design Options for Sustainability, part 1.9: Solar-Ready Design. Oro Valley (Arizona), Town of. 2009. Ordinance No. (O)09-11: An Ordinance of the Mayor and Council of the Town of Oro Valley, Amending Chapter 6, Article 6-1-7, "Residential Code" Otherwise Known as the "2006 International Residential Code" to Add a "Residential Solar Ordinance" Requiring Installation of Solar Ready Measures in Residential Construction. Rancho Palos Verdes (California), City of. 2011. Municipal Code. Title 15, Buildings and Construction; Chapter 15.04, Building Code; Section 15.04.070, Renewable Energy Systems. Tallahassee, Fla.: Municipal Code Corporation. Tucson (Arizona), City of. 2008. Ordinance No. 10549: Relating to Buildings and Construction: Requiring New Single Family and Duplex Residential Dwelling Units to Provide for Future Installation of Solar Energy Devices; "Residential Plan Review: Solar Ready Ordinance"; Ordinance No. 10605: Relating to Buildings and Construction: Amending the International Residential Code 2006…by Adding Local Amendments to Chapter 23, Section M2301, Solar Energy Systems. How do other communities use development regulations to encourage the installation of small-scale solar energy systems? When communities address solar energy systems (i.e., photovoltaic, solar thermal, and building integrated) in their development regulations, they may define these systems as accessory structures, accessory uses, or primary uses. The major tension in this issue is potential tradeoffs between system optimization and aesthetic effects on surrounding properties. Some communities permit accessory solar energy systems by right in all districts while others have special permitting processes that take into account site design and impacts to adjacent property owners. Over the past few years it has become increasingly common for communities to adopt specific standards for accessory solar energy systems to address placement issues without requiring a discretionary review. Bethany Beach (Delaware), Town of. 2010. Ordinance no. 455: An Ordinance to Add A New Chapter 484 "Solar Energy Systems" To The Town Code Of Bethany Beach. Brown (Minnesota), County of. 2009. Zoning Ordinance. Section 4, Rules and Definitions; Part 402, Definitions. Section 7, Performance Standards; Part 702, Solar Energy Systems and Solar Structures. Granville (North Carolina), County of. 2010. Code of Ordinances. Chapter 32, Land Development Code; Article III, Use Standards; Division 3, Section 32-162(5), Accessory Uses, Residential. Section 32-166(7), Accessory Uses, Nonresidential. Article XIX, Definitions – Solar. Tallahassee, Fla.: Municipal Code Corporation. Hermosa Beach (California), City of. 2011. Municipal Code. Title 17, Zoning; Chapter 17.46, Yard, Height, and Area Restrictions; Section 17.46.220, Solar Energy Systems Can Exceed Height Limits. Houston (Minnesota), County of. 2011. Zoning Ordinance. Section 28, General Provisions; Part 0110.2808, Solar Energy Systems and Solar Structures. Irvine (California), City of. 2011. Zoning Ordinance. Division 3, General Development Standards and Land Use Regulations; Chapter 3-31, Solar Energy System Standards. Tallahassee, Fla.: Municipal Code Corporation. Ithaca (New York), Town of. 2011. Town Code. Chapter 270, Zoning; Article III, Terminology; Section 270-5, Definitions. Article XXVI, Special Regulations; Section 270-219.1, Solar Collectors and Installations. Minneapolis (Minneapolis), City of. 2011. Code of Ordinances. Title 20, Zoning Code; Chapter 535, Regulations of General Applicability; Article XII, Solar Energy Systems. Chapter 537, Accessory Uses and Structures; Section 537.110, Solar Energy System. Tallahassee, Fla.: Municipal Code Corporation. Portland (Oregon), City of, Bureau of Development Services. 2010. Program Guide: Solar Water Heating and Photovoltaic Electric Generators Installed on One- or Two-Family Dwellings. Also, Program Guide: Solar Water Heating and Photovoltaic Electric Generators Installed on Commercial Buildings. Rock Hill (South Carolina), City of. 2011. Zoning Ordinance. Article 4, Use Regulations; Section 4-400, Accessory Uses and Structures; Table 4-400(B), Table of Permitted Accessory Uses. Part 4-400(D)(19), Accessory Uses and Structures Allowed – Ground-Mounted Solar Installations. Article 5, Density, Intensity, and Dimensional Standards; Table 5-200(A), Allowable Yard Encroachments. Article 6, Development and Design Standards; Section 6-800(B)(2)(e), Residential Design Standards – Roof Penetrations and Equipment. Section 6-800(C)(9)(c), Commercial and Institutional Design Standards - Roof Penetrations and Equipment. Article 10, Definitions. Schaumburg (Illinois), Village of. 2011. Code of Ordinances. Title 15, Land Usage; Chapter 154, Zoning; Section 154.27, Definitions. Section 154.56, Solar Energy Systems. Section 154.58, Solar and Wind Energy System Figures. Section 154.62, Building Heights, Bulk Regulations, and Required Yards – Solar Access Protection. Seattle (Washington), City of. 2011. Municipal Code. Title 23, Land Use Code; Subtitle III, Land Use Regulations; Division 2, Authorized Uses and Development Standards; Chapter 23.42, General Use Provisions; Section 23.42.130, Nonconforming Solar Collectors. Chapter 23.44, Residential, Single-Family; Section 23.44.046, Solar Collectors. Chapter 23.45, Residential, Multi-Family; Subchapter III, Accessory Uses; Section 23.45.545, Standards for Certain Accessory Uses – Solar Greenhouses, Greenhouses and Solariums. Chapter 23.47A, Commercial; Section 23.47A.012(C), Structure Height – Rooftop Features – Solar Collectors. Troy (Michigan), City of. 2011. Zoning Ordinance. Article 2, Section 2.02, Definitions. Article 12, Sustainable Design and Development Standards; Section 12.05, Solar Structures and Easements. Tucson (Arizona), City of. 2011. Land Use Code. Article III, Development Regulations; Division 2, Development Criteria; Section 3.2.5.2(E), Accessory Structures. Section 3.2.6.6(C)(1), Exceptions to Perimeter Yards – Structures Within Perimeter Yards. Section 3.2.7.3(D). Structure Height Measurement – Exceptions. Section 3.2.9.3(A)(5). Lot Coverage – Exceptions – Buildings. Section 3.2.12, Solar Orientation. Article VI, Definitions; Division 2, Listing of Words and Terms. West Lake Hills (Texas), City of. 2011. Code of Ordinances. Chapter 22, Building Regulations; Article 22.03, Construction Code; Division 1, Generally; Section 22.03.009, Solar Energy Devices. Lubbock, Tex: Franklin Legal Publishing. How do other communities regulate large-scale solar installations? Relatively few local governments address large-scale solar installations (i.e., solar farms) in their development regulations. Because utility-scale solar projects are typically subject to state or federal review as part of the permitting process, local codes that list development standards for these uses are rare. However, a growing number of communities are acknowledging large-scale solar installations as a legitimate land use. When development regulations do address large-scale solar installations, they are typically permitted as conditional uses in a limited number of industrial or agricultural zoning districts and may be subject to specific use standards to address aesthetics or minimize environmental impacts. Erie (Pennsylvania), City of. 2010. Ordinance No. 4-2010. Granville (North Carolina), County of. 2010. Code of Ordinances. Chapter 32, Land Development Code; Article III, Use Standards; Division 4, Limited, Conditional, and Special Uses; Section 32-233, Ground-Mounted Solar Power Energy System "Solar Farm" (NAICS 221119). Tallahassee, Fla.: Municipal Code Corporation. Huntersville (North Carolina), Town of. 2010. Zoning Ordinance. Article 9, Conditions for Certain Uses; Section 9.54(2), Solar Energy Facility – Major Solar Energy Facilities. Article 12, Definitions. Iron (Utah), County of. 2010. County Code. Title 17, Zoning; Chapter 17.16, Establishment of Zoning Districts; Section 17.16.030, Table of Uses. Chapter 17.20, Use Definitions; Section 17.20.010, Definitions. Chapter 17.33, Solar Power Plants. Chapter 17.84, Section 17.84.010, Definitions. Madera (California), County of, Resource Management Agency. 2010. "CZ #2009-008, Title 18 Revisions to Allow for Solar Farms." Staff report to Board of Supervisors. Ordinance No. 525NN. Port St. Lucie (Florida), City of. 2011. Code of Ordinances. Title XV, Land Usage; Chapter 158, Zoning Code; Article I, General Provisions; Section 158.006, Definitions. Article IV, General Use Districts; Section 158.060(C)(13), General Use Zoning District (GU) – Special Exception Uses. Article IX, Industrial Districts; Section 158.136(C)11, Industrial Zoning District (IN) – Special Exception Uses; Section 158.137(C)(4), Utility Zoning District (U) – Special Exception Uses. Article X, Supplementary Use Regulations; Section 158.230, Solar Energy. Tallahassee, Fla.: Municipal Code Corporation. Salisbury (Massachusetts), Town of. 2010. Code of Ordinances. Chapter 300, Zoning; Article XXIII, Solar Photovoltaic Installations Zoning Bylaw. San Antonio (Texas), City of. 2011. Unified Development Code. Article III, Zoning; Division 7, Supplemental Use Regulations; Section 35-398(b), Renewable Energy Systems – Solar Farms. Tallahassee, Fla.: Municipal Code Corporation. Santa Clara (California), County of. 2010. Ordinance No. NS–1200.331: An Ordinance Of The Board Of Supervisors Of The County Of Santa Clara Amending Appendix I Of The County Of Santa Clara Ordinance Code Related To Commercial Solar Energy Conversion Systems. Stearns (Minnesota), County of. 2010. Land Use and Zoning Ordinance #209. Section 3, Definitions. Section 6, Performance Standards; Part 6.50, Solar Energy Systems. Drafted by CR Planning, Minneapolis, Minn.
Straban (Pennsylvania), Township of. 2010. Ordinance 2010-02. What do other communities do to mitigate the effects of glare from solar panels on surrounding properties? One of the major tensions in regulating solar energy systems is the potential tradeoff between system optimization and aesthetic effects on surrounding properties. In practice, the amount of glare depends not just on the angle of installation but also on the specific product installed. Different types of solar panels absorb different amounts of light. Newer panels generally include at least one anti-reflective layer to maximize absorption and minimize glare. In fact, the reflectivity of solar panels is often much lower than that of other nearby materials (e.g., standard glass, snow, or steel). When communities address glare in their development standards for either rooftop or freestanding panels, the language is typically subjective. In other words, the standards usually say that systems must be designed and sited to avoid glare on adjacent properties or roadways without going so far as to require a glare study or specific glare mitigation techniques or technologies. Albany (New York), City of. 2011. City Code. Chapter 375. Zoning. Article XIV. Specific Use Regulations. Section 375-93. Solar energy equipment. Available at www.ecode360.com/?custId=AL0934. "Ground-mounted solar collectors are permitted as accessory structures in all zoning districts, subject to the following requirements: (4) The solar collectors do not emit unreasonable glare and negatively impact adjacent properties." Calabasas (California), City of. 2011. Municipal Code. Title 17. Land Use and Development. Chapter 17.20. General Property Development and Use Standards. Section 17.20.190. Solar Energy Development Standards. Available at http://library.municode.com/index.aspx?clientId=16235&stateId=5&stateName=California. Dundee (Michigan), Township of. 2010. Ordinance No. 09-10-01: Solar Panel Zoning Ordinance Amendment. Available at www.dundeetownship.info/zoning_ordinance.asp. Lincolnshire (Illinois), Village of. 2011. Municipal Code. Title 6. Zoning. Chapter 17. Alternative Energy Collection Systems. Section 6-17-6. Solar Energy Systems (SES). Available at www.village.lincolnshire.il.us/code/code0617.pdf. Shoreham (Vermont), Town of. 2004. Zoning Bylaws. Section 341. Conditional Use Review. Subsection G. Performance Standards. Section 527. Solar and Wind Energy Systems. Available at www.shorehamvt.org/town/docs/Shoreham-Zoning.pdf. How do other communities address solar energy systems in historic districts? In many cases solar energy systems are not visually compatible with historic structures or districts. However, many planners, preservationists, and solar advocates recognize the value of adding solar energy systems to historic structures and are eager to find solutions to this tension between aesthetics and historic preservation. A recent report, Implementing Solar PV Projects on Historic Buildings and in Historic Districts, co-authored by the National Renewable Energy Laboratory and the National Trust for Historic Preservation includes a series of guidelines for siting solar energy systems on historic properties. Though some communities prohibit solar energy systems on historic structures altogether, many others do make accommodations for solar installations. The typical solution is to allow roof-mounted systems as long as they are not visible from the street, are restricted to rear sections of the roof or located on non-historic additions, lie flush with the roof pitch, and do not protrude above the roofline. Given these restrictions, ground-mounted systems are often preferable, provided that they can be sited out of sight from the public right-of-way and in a location that receives adequate sunlight. Aurora (Illinois), City of. n.d. Rehabilitation and Restoration Guidelines. Available at www.aurora-il.org/documents/historicpreservation/HistoricPropertyGuidelines.pdf. "Satellite Dishes, Antennas, and Solar Panels" section requires that solar panels be hidden from public view by placing them at rear rooflines, behind gables and dormers, and flush with the roofline (p. 88). Boulder (Colorado), City of. 1994. Mapleton Hill Historic District Design Guidelines. Part VI, Section V. Solar Additions. Available at www.bouldercolorado.gov/files/PDS/historicpres/pdfs/maplhill.pdf. Solar panels should be placed on the ground or flat to the roof pitch and out of sight, and metal should be finished to relate to surrounding materials. Solar greenhouses on the street facade are inappropriate (p 22 of PDF). Montgomery (Maryland), County of. 2011. Design Guidelines for Historic Sites and Districts in Montgomery County, MD. Chapter 3, Part 9.0. Solar Panels. Available at www.montgomeryplanning.org/historic/designguidelines.shtm. Includes guidance and illustrations on proper location and installation of solar panels so as not to adversely affect the historic character of the structure to which they are being added. St. Cloud (Minnesota), City of. 2011. Land Development Code. Article 13, Section 13.4.B.5. Commercial Historic District Design Guidelines - Accessory Structures and Appurtenances. Available at www.ci.stcloud.mn.us/planning/LandDevCode.aspx. Accessory structures and appurtenances should be located on the roof or to the rear of buildings and screened by appropriate plantings or fencing; solar panels and television aerials should be situated as far out of public view as possible.